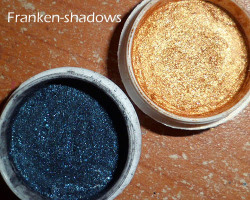 The Makeup Box: Navy and Gold Evening Look with "Frankenshadows"! 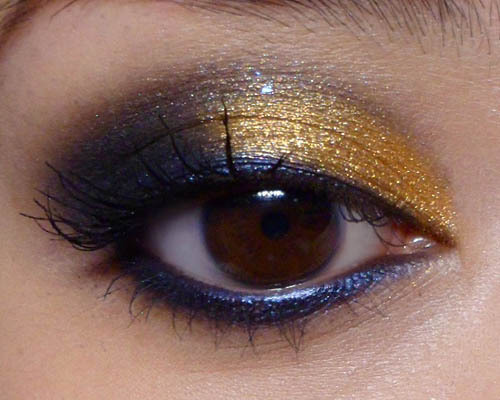 Navy and Gold Evening Look with "Frankenshadows"! I like blending and mixing my own shadows. I do this mostly with loose mica, glitter, and binders, and sometimes I crush up unwanted shadows, mix them with other shades, and then press them into something entirely new. In the nail polish community, your own blends of varnishes are called Frankenpolishes. Well, these are my Frankenshadows. 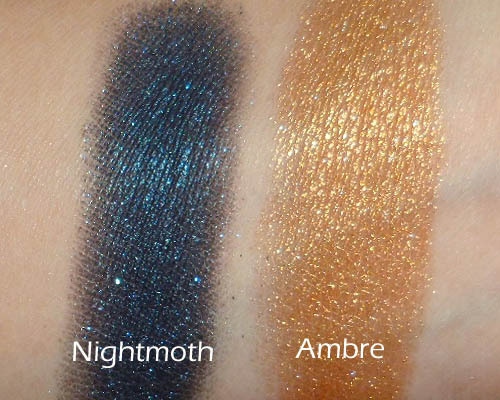 Nightmoth: This is a black matte pigment mixed in with metallic navy shimmer, with a pinch of aqua glitter thrown in. I can't think of an alternative in the stores for you, but any very dark navy shade would do. You can always pat a little glitter on top for a similar effect. Ambre: This is more of a generic warm metallic amber-gold that you can find easily I believe. Step 1: First, lay the base. You want the shadow to always be most intense around the lash line, so I used a dark blue pencil (MAC Blooz is no longer available but they have alternatives) and ran it along the lash line, top and bottom. Along the top lid, make the lid very thick. Step 2: Using a firm brush, very gently smoke the edges of the pencil out. On the top lid, I smudged it much further out so it fades towards the socket line. Step 3: The navy shadow. I used a flat shadow brush to first gently pat shadow onto the outer halves of the lids, up to the socket line. 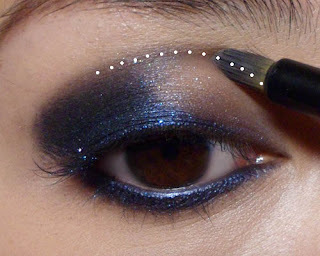 I also packed it right on the lash line, to set the dark navy liner. Step 4: With the fine smudger brush once again, I pulled the blue shadow inwards along the socket line so it faded inwards. Don't pick up any more shadow with your brush, because the line is supposed to be very soft rather than hard and precise. Step 5: Using a smaller shadow brush for precision, I packed the warm gold metal shadow right onto the inner half of the lids in a tear-drop shape. It should fade into the blue but not be over-blended where they meet. That would muddy up the entire look. The gold and the blue should still stay very intense and clean. Step 6: With a fluffy blending brush, I started to soften the edges of the navy shadow, which can be quite hard against paler skins. You want to ONLY BLEND ALONG THE SOCKET LINE. If you bring your brush down any lower, you will muddy up the gold. The entire look could go from navy-and-gold to plain ol' charcoal in a second.